10 awesome Home Remedies with Honey! Consume 1-2 tablespoons of Honey a day. Mix 1 tablespoon honey with 1 cup of hot water, stir well, then drink and enjoy. Add lemon if you like the taste. Honey acts as a natural expectorant, promoting the flow of mucus. Place a thick layer of honey where you feel pain and cover with a cotton cloth. Honey helps to soothe inflammation. Place a slice of pineapple in a little water to boil. Then leave the liquid to cool and add 1 tablespoon honey. Preparation: In a jar mix 1/2 Cup warm milk, 3.5 oz of honey and the juice of one lemon strained. Mix all the ingredients. Apply to the skin at night and in the morning rinse with lukewarm water. 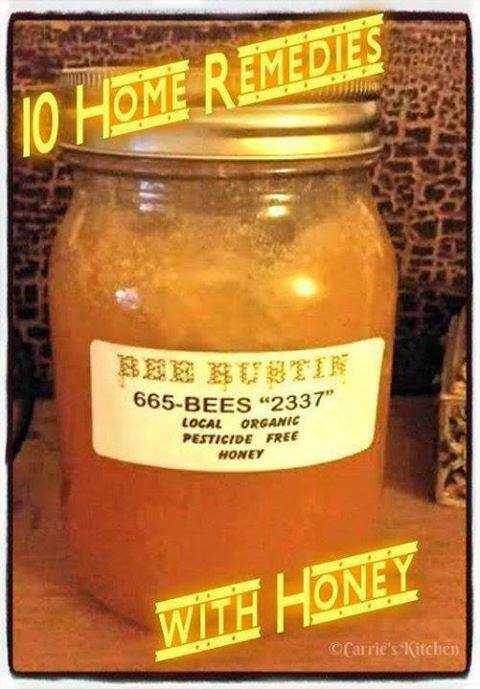 6) Burns: Cool the burn with cold water, then apply a thick layer of honey and bandage it. Honey protects the wound from bacteria. **Tip: Honey is added to cooled tea, to retain the healing properties of the honey. Drink one glass before meals. Preparation: Boil 1 liter of water, then add 1 tablespoon salt. Let the water cool and add 2 tablespoons of honey. Check out more awesome -> household tips!